It’s my nephew’s birthday, too! 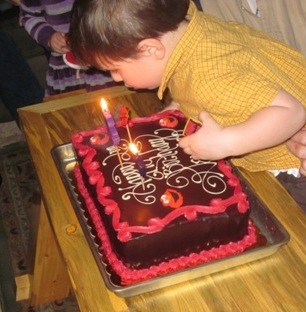 Don’t lean too close to your birthday candles. You’re liable to burn your nose. Believe me, I saw it happen. My weekend was obviously good (cake was involved). My weekend was great! Thanks for asking! I love the cake!!! It is SO pretty!!! how cute! that cake looks awesome, and btw I food gawked for two hours last night and thought of you. Ha ha uh oh, I’m ushering others into foodgawker addictions! Did you make the cake yourself!? It looks so yummy – What was the inside flavor?? My weekend was great – lots of exercise, relaxation and yummy food! I wish I had the baking chops to pull off a cake like that! My brother’s mom (half brother) works at Whole Foods and a co-worker did her a favor and made the cake for the party. It was chocolate and the frosting seriously tasted like fudge, mmmmm. Cute picture! Glad you had a great weekend! Too cute! We had my dad’s 50th b-day yesterday, I baked his cake with the best darn frosting ever 🙂 So I had lot’s of cake in my weekend as well. I hope to see the frosting recipe on your blog!